“We’re becoming part of the art” is what Busy Philipps said about her and Michelle Williams (actress) during their BFF day spent partially at The Broad in April 2017. Victoria Beckham explored the “Yayoi Kusama Infinity mirrored room” and the “Takashi Murakami” art here with Brooklyn Beckham in April 2017. 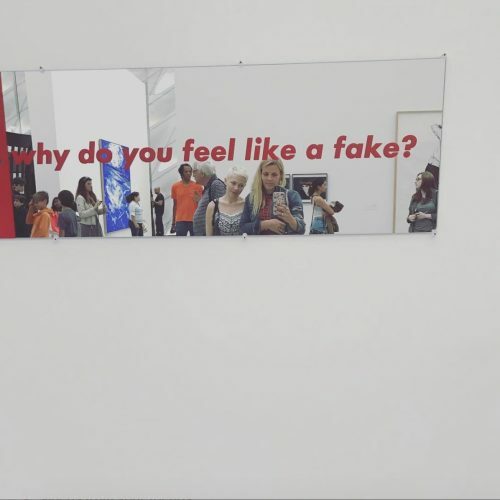 In March 2017, Tallulah Willis “had a date with my mom today and was most intrigued by the blueberry-spittle shaped words” contained in one of the pieces she saw hanging on the walls here. Paris Jackson flashed a peace sign while posing with the Jeff Koons statue of her father and Bubbles the monkey here in March 2017 — she also took a turn in the mirrored room during her visit. Kelly Rutherford struck a pose beside the oversized plates sculpture by Robert Therrien when she visited The Broad in March 2017. Ruby Rose was “Absorbing all of the amazing Basquiat art” and snapped an obligatory selfie inside Yayoi Kusama’s Infinity Mirrored Room in March 2017. Wiz Khalifa “Went to da museum . . . And beyond” in February 2017, spending time admiring the art and stepping inside the Infinity room. The unique escalator, artist Glen Ligon‘s “Double America 2, 2014,” and “Yayoi Kusama’s Infinity Mirrored Room @thebroadmuseum” were all on Mena Suvari‘s itinerary when she was here in February 2017. Kevin McHale said “Thiiiiiiis looks familiar” while standing in front of an escalator here in January 2017. He also commented, “RIP,” when he saw the “Michael Jackson and Bubbles” porcelain sculpture on display here. Hilary Duff hung at The Broad in September 2016 and checked out both the Infinity room and the Under the Table exhibit. In July 2016, Katie Holmes said, “Loved my time” inside the Infinity Mirrored Room. LeAnn Rimes “Loved our time” at The Broad in May 2016 and teased, “One day I’ll be able to sit at the adult table” when she was standing next to the “Under the Table” exhibit. Jerry Ferrara joked, “IM SHRINKING” when he was underneath Robert Therrien’s Under the Table and called the sculpture of Michael Jackson and Bubbles “interesting” in May 2016. Rita Ora snapped a sparkly selfie in the Infinity Mirrored Room in April 2016. Emma Roberts said “Words cannot begin to describe” her experience checking out the work of Andy Warhol here in April 2016. Lionel Richie leaned against the wall next to “My all time favorite from Jean-Michel Basquita,” a skull painting, when he was here in April 2016. He also admired the “Most wanted men” series by Andy Warhol. Rosie Huntington-Whiteley shared a shot of blue Jeff Koons balloon dog at The Broad in March 2016. Autumn Reeser quoted Rumi with “I am a spark from the infinite” and thanked The Broad “and Kusama for making me feel exactly so” in March 2016. Ryan Phillippe admired the Jeff Koons statue of Michael Jackson and Bubbles as well as the work of Takashi Murakami when he went by The Broad in March 2016. Jamie Chung was all about “All of the lights” inside The Broad’s infinity room in March 2016. She also stood beneath Robert Therrien’s “Under the Table” exhibit. Michelle Trachtenberg declared “Chilly Saturdays in LA are for museums,” so she made her way to the “magical” infinity mirror room at The Broad in March 2016. Kourtney Kardashian and her kids checked out the Takashi Murakami collection as well as the infinity room in February 2016. Jesse Tyler Ferguson called his Valentine’s Day trip to The Broad in February 2016 with Justin Mikita “A perfect outing” and said that it contains “an inspiring and amazing collection of art!” The two took a picture in Yayoi Kusama’s Infinity Mirrored Room. James Franco was “Chillin” at The Broad in February 2016 by Robert Therrien’s “Under the Table” art installation. Being Madden and Cameron Diaz wished everyone a Happy New Year in January 2016 “from the Madden Fam” from inside Yayoi Kusama’s Infinity Mirrored Room — The Souls of Millions of Light Years Away. It was Nicky Hilton‘s turn to take a selfie inside the infinity room here in December 2015 and admire the Jeff Koons collection there. Nicole Richie and Joel Madden brought their kids to The Broad in December 2015 to teach them art “Appreciation” — the famous family spent time in the Takashi Murakami exhibit and had “Interstellar Dreams” in the infinity room. Minka Kelly snapped a selfie inside Yayoi Kusama’s Infinity Mirrored Room — The Souls of Millions of Light Years Away in November 2015. Portia de Rossi brought her mother-in-law to The Broad in November 2015 — they checked out Robert Therrien’s Under the Table and Portia posed in Yayoi Kusama’s Infinity Mirrored Room — The Souls of Millions of Light Years Away. Autumn Reeser was “Digging all the Cy Twombly works” at The Broad in November 2015. January Jones joked, “Mommy?! I’m so tiny, help.” while standing beneath Robert Therrien’s “Under the Table” in November 2015. Solange Knowles shined the spotlight on her friend as she went up the escalator here in October 2015. Kate Hudson and a friend were a “Couple a broads at The Broad” when they checked out the Takashi Murakami collection together in October 2015. Reese Witherspoon posed beside Urs Fischer’s “Untitled, 2012” steetlight sculpture when she was here in September 2015.